CEM offers a range of unique products for rapid and accurate testing of meat products. Our instruments provide simple analyses for rapid fat, moisture, and protein determination, while avoiding the challenges that meat-based compositions present for NIR (Near Infrared) techniques. Both the ORACLE™ and ProFat™ Meat Analyzer provide rapid, accurate fat or chemical lean (CL) analysis, allowing customers to maximize raw materials and practice Least Cost Formulation (LCF). Both systems eliminate the challenges associated with NIR, including extensive calibration development and maintenance. ORACLE is based on a breakthrough in NMR technology that eliminates method development and ProFat arrives pre-programmed with an extensive library of robust methods for fat, moisture, and protein analysis. This is ideal for a market where ingredients and compositions constantly fluctuate. Using AOAC approved technologies for both fat and moisture analysis, both systems provide the most accurate and precise analyses available, allowing them to be used as sole testing platforms or as a means to calibrate in-line NIR or X-ray systems. 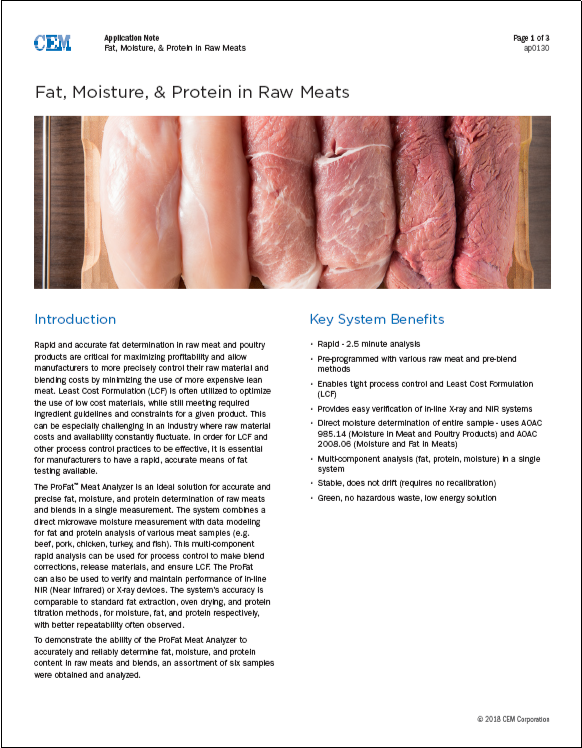 Read how the ProFat is the best fat, moisture, protein analyzer for raw meat products. 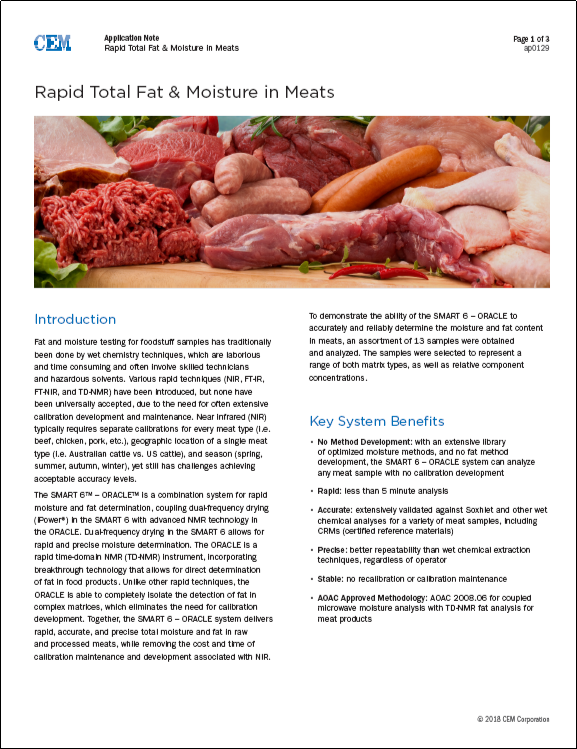 Read how the SMART 6 — ORACLE is changing the landscape of fat and moisture analysis in any meat product.